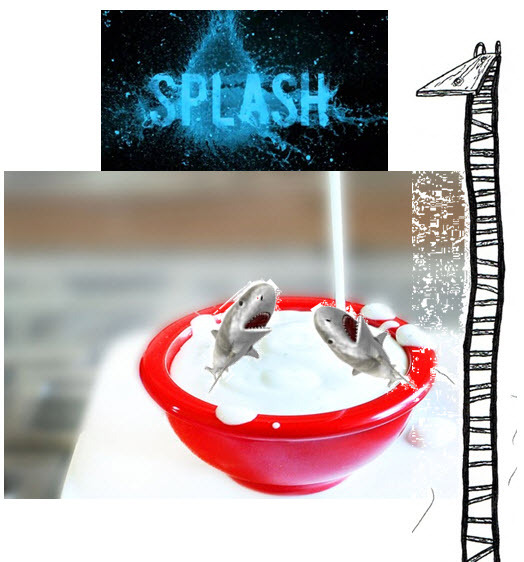 ABC’s “The Splash” Would be More Interesting If Diving was into Pools of Ranch… With Sharks. One of the best parts about Ranch Dressing is that it adds flavor to otherwise dull or crappy food. Of course ranch is best when paired with good quality food but hey its a fact of life. This is why i wonder why the makers of ABC’s The Splash didn’t think to add some ranch goodness to make their new show a bit more interesting. Currently the show features D-list celebrities jumping into a pool. WOW! I get more excitement letting my french fries dive into my little cups of ranch at restaurants. I could only watch 15 minutes of the show while at the gym but all i could think about was how ranch dressing would have made the show better for both the contestants (taste reasons) and the viewers. To really make it an A+ show comparable to a great show like ABC’s LOST producers should have added sharks. Yes sharks. Sharks swimming in ranch dressing terrorizing the poor d-list celebrities. I suppose if you must watch The Splash you should go to the restaurant in your town that serves the best ranch dressing and watch it there. Or just go on Facebook…. Note: LOST did feature ranch dressing, proving that any show, no matter what the setting, can correctly incorporate ranch. You are currently browsing the archives for the ranch dressing category.